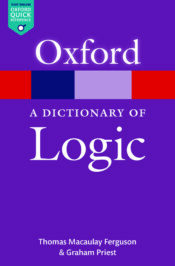 This dictionary, recently published on Oxford Reference, features over 450 entries which primarily concentrate on technical terminology, the history of logic, the foundations of mathematics, and nonclassical logic. In the development of Western logic, there have been three very significant phases interspersed with two periods of stasis—and even forgetfulness. (Logic in Eastern philosophy has its own story to tell.) The first was in Ancient Greece, where logic was developed quite differently by Aristotle and the Stoics. The second phase was at the hands of the great Medieval logicians, such as Jean Buridan and William of Ockham. They took up their Ancient heritage, but developed it in many new ways, with theories of suppositio (truth conditions), insolubilia (paradoxes), consequentia (logical consequence), and other things. The rise of Humanism in Europe had a profound effect. Scholasticism was swept away, and with it went all the great Medieval advances in logic. Indeed, it was only in the second half of the 20th Century that we have come to discover the many things that were lost. All that remained in the 18th Century was a somewhat stylized form of Aristotelian logic. That is what Kant knew, and that is why he believed that there had been no advances since Aristotle. 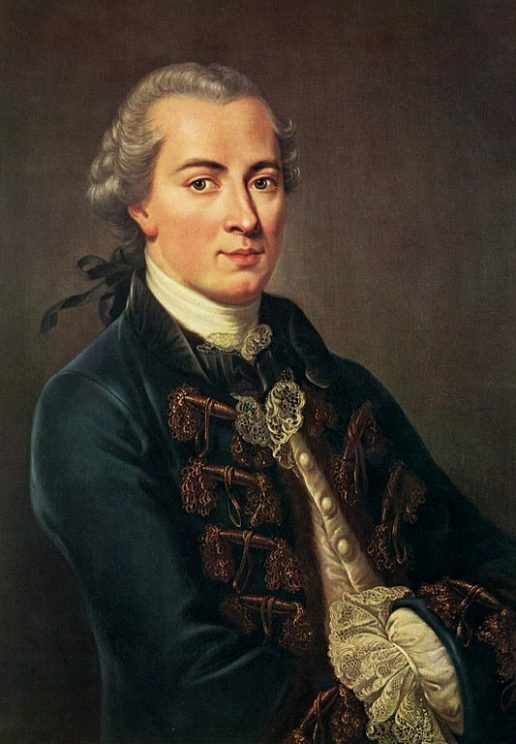 Portrait of Immanuel Kant (1724-1804). Public Domain via Wikimedia Commons. The third great period in the development of logic is the contemporary one. The ground for this was laid in the middle of the 19th century by algebraists, such as George Boole. But, driven by questions in the foundations of mathematics, a new canon of logic was invented by Gottlob Frege, taken over by Bertrand Russell, and then polished by some of the greatest mathematicians of the first half of the 20th century, such as David Hilbert and Kurt Gödel. The view that emerged came to be called classical logic—somewhat oddly, since it has nothing to do with Ancient Greece or Rome. Indeed, it is at odds with elements of both Aristotle’s logic and Stoic logic. At any rate, by the middle of the 20th Century it had become completely orthodox. It is now the account of logic that you will be taught if you take a first course in the subject in most places in the world. However, this very orthodoxy can often produce a blindness akin to Kant’s. The way that logic is taught is usually ahistorical and somewhat dogmatic. This is what logic is; just learn the rules. It is as if Frege had brought down the tablets from Mount Sinai: the result is God-given, fixed, and unquestionable. No sense is provided of the fact that logic has been in a state of development for two and a half thousand years, driven by developments in philosophy, science, and mathematics—and now computer science. Indeed, many of the most intriguing developments in logic for the last 50 years are in the area of non-classical logic. Non-classical logics are logics that attempt to repair various of the inadequacies perceived in classical logic—by adding expressive resources that it lacks, by developing new techniques of inference, or by accepting that classical logic has got some things just plain wrong. In the process, old certainties are disappearing, and the arguments generated in new debates give the whole area a sense of excitement that is rarely conveyed to a beginning student, or understood by philosophers not party to these debates. What generated the third phase in the development of logic was its mathematization. Techniques of mathematics were applied to the analysis of logical consequence, to produce theories and results of a depth hithertofore unobtainable. For example, the work of Kurt Gödel and Alan Turing in the first half of the 20th century, established quite remarkable limitations on axiomatic and computational methods. But, for all its mathematical sophistication, the developments in logic were driven by deep philosophical issues, concerning truth, the nature of mathematics, meaning, computation, paradox, and other things. The progress in this third phase shows no sign, as yet, of abating. Where it will lead, no one, of course, knows. But one thing seems certain. Logic provides a theory, or set of theories, about what follows from what, and why. And like any theoretical inquiry, it has evolved, and will continue to do so. It will surely produce theories of greater depth, scope, subtlety, refinement—and maybe even truth. Featured image credit: ‘Logic Lane’ by Adrian Scottow. CC BY-SA 2.0 via Flickr. Thomas Macaulay Ferguson is a doctoral candidate in philosophy at the CUNY Graduate Center. His primary interest is philosophical logic, with focuses on many-valued model theory, paraconsistent logic, and the logical work of William Parry. His work has appeared in Notre Dame Journal of Formal Logic, Studia Logica, Journal of Philosophical Logic, Journal of Logic and Computation, and Logica Universalis. Graham Priest is Distinguished Professor of Philosophy at the CUNY Graduate Center, and a regular visitor at the University of Melbourne and at St. Andrews University. He is well known for his work on non-classical logic, and its application to metaphysics and the history of philosophy. His publications include One: Being an Investigation into the Unity of Reality and of its Parts, including the Singular Object which is Nothingness (2014, OUP, available online and in print) and Logic: A Very Short Introduction (2000, OUP, available online and in print). Thank you sirs for your insight! I loved this piece. I’m just starting to get into formal logic myself, and I can’t stop reading about Non-Classical Logics; they’re very interesting! I’m a Computer Science undergrad myself, so they most experience I have with Non-Classical logic is with the Database Language “SQL”. It’s underlying logic has 3 truth-values, and allows for violations of both Excluded Middle and even of Identity. Now those were headaches to think about initially, haha! The article itself is illogical; that, as the author states, we have had three distinct phases when we viewed logic differently, points to differences in men, times and the way things were then thought about. Core, immutable Logic has remained consistent; the way we think about it has changed. 5 + 5 has always equalled 10. The way that logic is taught is usually ahistorical and somewhat dogmatic. This is what logic is; just learn the rules. It is as if Frege had brought down the tablets from Mount Sinai: the result is God-given, fixed, and unquestionable. No sense is provided of the fact that logic has been in a state of development for two and a half thousand years, driven by developments in philosophy, science, and mathematics—and now computer science. I’ll take it as given that the way that logic is taught, at least in the standard courses in the propositional and predicate calculi, is usually ahistorical. But things go downhill from “somewhat dogmatic” on. Not the way I was taught or the way I have taught it; it has been my experience that the aim of responding to the questions that arise is that the answer be, not just given and accepted, but understood. And then it gets worse. As someone about to start teaching formal logic to undergraduates, I’d be interested if the authors or other readers had suggestions of ways to teach logic in a way that is sensitive to logic’s history and evolution. In particular, are there any textbooks that do this well?